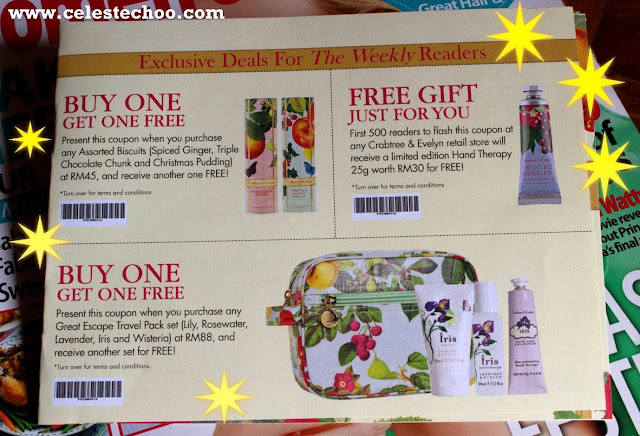 CelesteChoo.com: FREE items to redeem with your copy of Malaysian Women's Weekly this month! FREE items to redeem with your copy of Malaysian Women's Weekly this month! 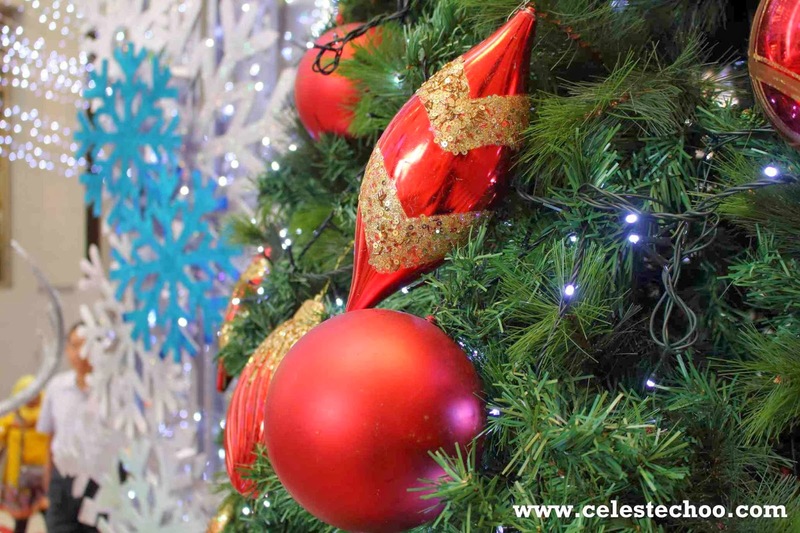 It’s the 1st day of December, everyone! The countdown to Christmas officially kicks in. And what better way to celebrate than start grabbing gifts and freebies! In this month’s issue of Malaysian Women’s Weekly, you’ll find a lot of timely ideas and suggestions for the holiday season. 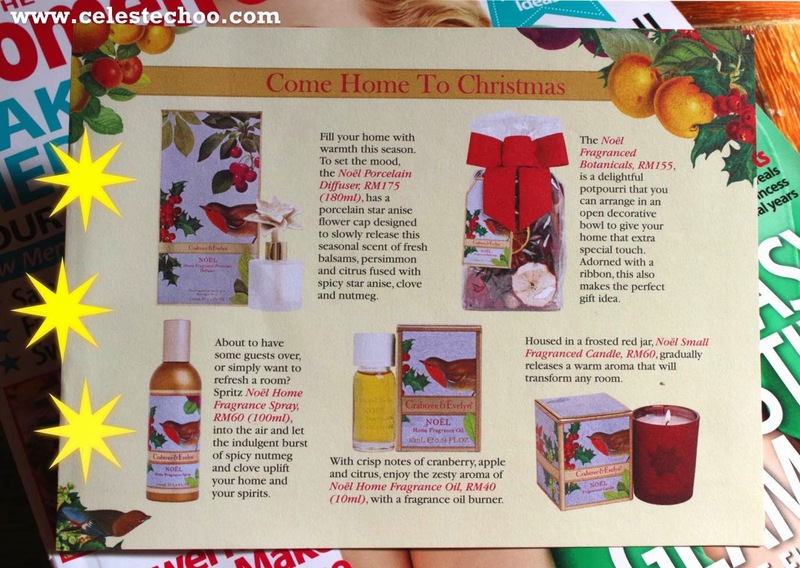 It comes with booklets of wonderful information, a free body butter and more. 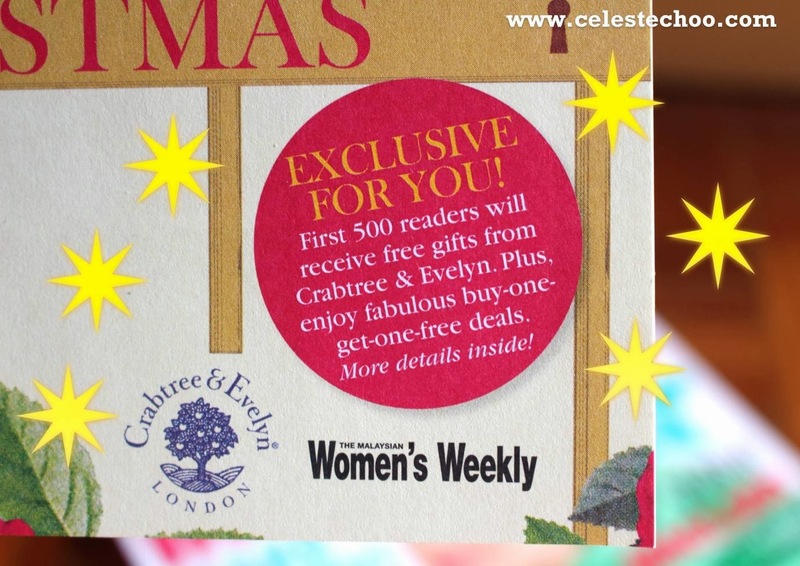 With the season of gift-giving just 3 weeks away, the Malaysian Women’s Weekly also bring you irresistible deals from Crabtree & Evelyn! 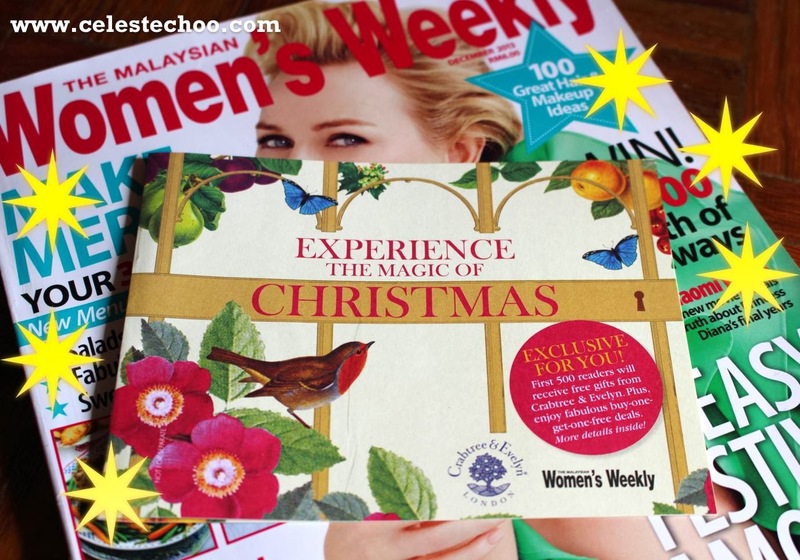 A booklet aptly titled ‘Experience the Magic of Christmas’ is bundled together with this month’s magazine. First up, and better pay attention, ladies, is (drum roll) FREE Gifts for the first 500 readers of the Malaysian Women’s Weekly! What will you get? Read on! Crabtree & Evelyn has several home gift ideas. In the section ‘Come Home to Chritsmas’, you’ll find the Noël Porcelain Diffuser 180ml at RM175, Noël Fragranced Botanical at RM155, Noël Home Fragrance Spray 100ml at RM60, Noël Home Fragrance Oil 10ml at RM40 and Noël Small Fragranced Candle at RM60. ‘A Little Something for Everyone’ has great ideas for our loved ones. For colleagues, there’s Deluxe Hand Therapy Sampler that contains 12 variants of hand creams, at RM178. This is a good idea for those hand cream addicts. For our sisters, there’s Rosewater Great Escape at RM88, which contains a Bath & Shower Gel, Body Lotion and Hand Therapy. For mothers, there’s Lily Ultimate Luxury at RM308, which contains a Bath & Shower Gel, Body Lotion, Hand Therapy and an EDT fragrance packed together in a golden vanity case. That’s something I would want for myself; hey, I’m a mummy! For your best friend, there’s Somerset Meadow Vanity Case at RM298, which contains a Bath & Shower Gel, Scented Body Lotion, Hand Therapy and and EDT fragrance packed in a oval golden vanity case. And for you, there’s Tarocco Orange Perfect Pair at RM130, which contains a Bath & Shower Gel and a Body Lotion with Tarocco orange, eucalyptus and sage. ‘Eat and Be Merry’ features tempting delights for those with “sweet teeth”. There’s Festive Bauble at RM65 that contains 150g of creamy, indulgent fudge-flavoured chocolates. There’s Musical Tin with Jelly Babies at RM80 that contains 300g of naturally-coloured and –flavoured jelly candies. For biscuit lovers, there’s Assorted Biscuits at RM45 that come in three flavours: Spiced Ginger (165g), Triple Chocolate Chunk (190g) and Christmas Pudding (195g). And who can resist ginger bread? There’s the Gingerbread Men Tin at RM65 that contains 60g of lovely ginger bread in adorable shapes. 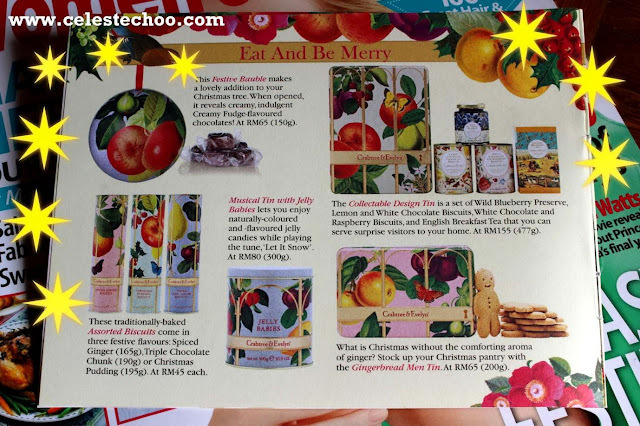 For the sweet stuff addict, there’s the Collectable Design Tin at RM155 that contains Wild Blueberry Preserve, Lemon Preserve, White Chocolate Biscuits, Raspberry Biscuits, White Chocolate and English Breakfast Tea. That’s simply perfect for a beautiful and delicious breakfast for the holiday! And the moment you’ve been waiting for, here are some exclusive deals for the Malaysian Women’s Weekly readers until 31st December 2013! 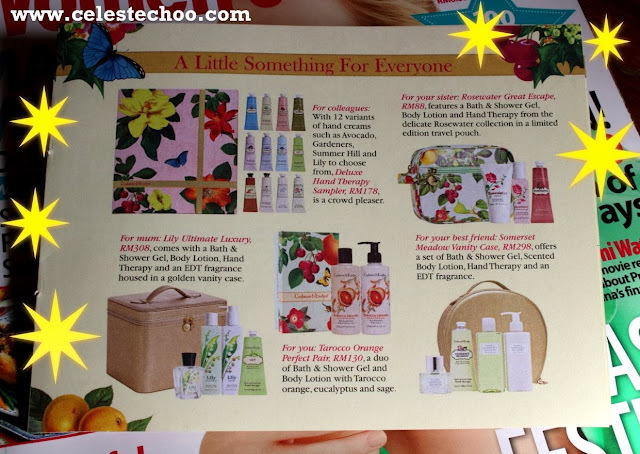 FREE GIFT: a limited edition Hand Therapy 25g worth RM30 for the first 500 readers to flash this coupon at any Crabtree & Evelyn retail store! So grab your copy of the Malaysian Women’s Weekly now and enjoy these exclusive offers!